SKU: 1209. Categories: All Products, Racetams. Tags: buy, capsules, Popular Nootropics, pramiracetam, pramistar, study smart drugs, USA. Pramiracetam is a strong nootropic drug synthesized in Belgium in the 1970’s. It belongs to the racetam class of nootropic substances just like: piracetam, aniracetam and oxiracetam. Unlike its predecessor piracetam, pramiracetam is more powerful. It also has longer lasting effects. 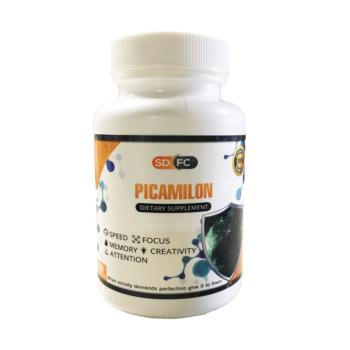 Studies indicate that it is 8 to 30 times stronger than piracetam. Pramiracetam is available by prescription under the name Pramistar in several countries within Europe. In those countries, doctors prescribe it as a general nootropic, especially for those with dementia and cognitive decline caused by aging. In the USA, it has no accepted medical use. However, you can still easily obtain it without a prescription online. If you compare both pramiracetam and piracetam, the former is more effective in improving cognitive functions. It has similarities and differences to other racetams in terms of its cholinergic effects. One of its unique benefits is improve High Affinity Choline Uptake. You need to take Pramiracetam orally. Once ingested, the body absorbs it from the alimentary canal (gut) into the bloodstream. It takes around 30 minutes to get into peak plasma levels. It is highly bioavailable due to its lipophilic nature. Due to its lipophilicity or fat-soluble properties, you need to take it with food. This maximizes its absorption in the gut. Like other racetams, it has effects on the cholinergic system, which refers to the neurotransmitter system useful for acetylcholine. Acetylcholine is a vastly important neurotransmitter with implications on learning, memory formation, reflexes and coordination. Pramiracetam does not work as a positive allosteric modulator of acetylcholine like other racetams. Its primary effect is increasing High Affinity Choline Uptake (HACU). Another racetam, which shares this ability with pramiracetam is coluracetam. HACU is the primary method wherein the brain converts choline into acetylcholine. This unique nootropic enhances HACU by improving the synthesis rate of the acetylcholine neurotransmitter. In addition to cholinergic effects, it also influences the glutamatergic system. It works as a modulator of AMPA and NMDA glutamate receptors in the same way as other racetams. This improvement also leads to better cognitive functioning. Pramiracetam also works effectively in improving memory and learning capacity in those suffering from dementia, Alzheimer’s disease, dyslexia and alcoholism. It has several health benefits because it works as a general nootropic. Its unique mechanisms make it one of the strongest cholinergic racetams. It works for those who need an instant mental boost. In Alzheimer’s disease treatment, it is effective in improving attention span, learning capacity, memory, time-space orientation and overall mental performance. It also stimulates the cholinergic and glutamatergic systems. These are partially responsible for memory capacity, short-term memory retention, learning ability and sensory perception. Other benefits include enhancing brain metabolism by stimulating oxidative catabolism and increasing energy levels through improved ATP-turnover. It also enhances cAMP levels phospholipid metabolism and increases protein biosynthesis. Along with this, it can increase communication across the corpus callosum. This refers to an in the brain, linking two hemispheres of the brain. This helps generate new ideas and improve language skills. Most people can tolerate pramiracetam, but not without side effects. A good rule of thumb is to start small with your dosage. Test your tolerance of the substance first. Some people need smaller amounts. Others, on the other hand, require a higher mg/kg to see results. Always consult your doctor before use, especially if you are on other medications. At this time, there are no listed drug interactions of concern. By far, the most common side effect seen with it is headache. Since it is highly cholinergic, the risk of headache is fairly common. The best way to avoid this is to supplement with choline. If headache still continues as a side effect, try lowering the dosage. It’s also advisable to discontinue supplementation if it continues past that. No deaths have been reported, but one still needs to be cautious when using it. Avoid ruling out rare allergic reactions. Stay away from it if you’re pregnant or breastfeeding or if you have liver impairment. Although it is a completely safe medicine with little known toxicity or contraindications, always consult a doctor before use. The recommended dosage is 15 mg per kilogram of body weight. However, it’s best to start with a lower dose of 50 mg daily. You can then gradually increase the dose as you see fit. Kindly follow the dosage recommendations as instructed on the label. Consult your doctor for more details. It is available in the form of capsules or bulk powder from online distributors. It’s effective on its own, but stacking it may increase its overall benefits. It’s highly cholinergic; hence, may stack well with other nootropics in the same category. Most stacks involving it are advanced study stacks. It is more suitable during those periods of heavy mental workload. Adrafinil or Oxiracetam – Stacking it with adrafinil or oxiracetam is beneficial for those looking for a powerful mental energy stack. Oxiracetam, a stimulating racetam that amplifies acetylcholine receptors, pairs quite nicely with the effects of pramiracetam. Adrafinil, a dopaminergic wakefulness enhancer, also pairs nicely. Choline – If you are planning to stack pramiracetam, consider choline as your first choice. The two synergize well together. Since the former improves choline uptake and synthesis, one should feed the necessary precursors. Choline bitartate is a good choice as a choline supplement. However, alpha GPC and citicoline are also great options. Note: If you are taking it for the first time, you may want to try it out on its own first. Stacking it with others can increase the chances of side effects and negative interactions. In the US, Nootropics like pramiracetam are neither FDA approved nor a controlled substance. This means, the US residents can legally possess them without any prescription. In Canada, all controlled and regulated drugs have DIN or Drug Identification Numbers Drug regulatory agencies in Canada assigns these numbers. Currently, Pramiracetam does not come with an assigned DIN. However, it’s legal to import this supplement for individual use. Note that you only have a limited order of 1-3 month supply. In the UK, it is an unregulated drug. In 2016, laws changed so that all unregulated drugs and chemicals became illegal to possess and distribute. Furthermore, in Australia, it is not listed as a poison or controlled substance. Commercial use is illegal, but it’s possible to obtain it for personal use. The quantity must be small. This can prevent custom delays or seizures if you are importing it.